Let us recap for a moment. In “The Hangover” there was a wedding that was almost missed, four friends, a missing person, and strippers. This plot was the anthem for the summer of 2009. The movie was refreshingly funny and brought scenarios to the silver screen that had not been seen in that light before. 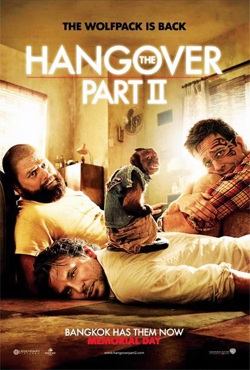 In “The Hangover Part II,” Phil (Bradley Cooper), Stu (Ed Helms), Alan (Zach Galifianakis) and Doug (Justin Bartha) travel to Thailand for Stu’s wedding. After the unforgettable bachelor party in Las Vegas for Doug’s wedding, Stu is taking no chances and wants nothing more than a pre-wedding brunch. However, with this group of guys and Alan behind the wheel, things don’t go as planned. What happened in Vegas is one thing but what happens in Bangkok is another. “The Hangover Part II” strangely follows almost all of the same patterns as the original, almost as if the writers found gold and couldn’t part with it. Although the same patterns and some really familiar scenarios with different faces arise, “Part II” still delivers many laughs. The plot does thicken and takes one, maybe two routes that were not expected, but other than that, moviegoers can pinpoint what will happen next. Bottom line — the movie is strangely familiar and funny. If a movie patron is looking for twists and turns maybe a thriller would be better suited than a sequel.